édité le 17/12/2018 - Plus de news de "Qatar Petroleum" - Voir la fiche entreprise de "Qatar Petroleum"
Qatar Petroleum entered into an agreement with Eni to acquire a 35% participating interest in three offshore oil Fields in Mexico. The agreement is subject to customary regulatory approvals by the government of Mexico. 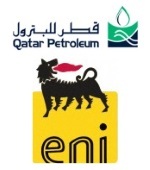 Following such approval, both Eni and Qatar Petroleum will jointly hold 100% interest in the Area 1 production sharing contract. The National Hydrocarbon Commission of Mexico approved the phased development plan for Area 1 allowing for early production to start by mid- 2019 through a wellhead platform in the Mizton field and a multiphase pipeline for treatment at an existing Pemex facility. The full field production is expected to be achieved in 2021 through a floating production, storage, and offloading facility with a treatment capacity of 90,000 barrels of oil per day. Two additional platforms will be installed on the Amoca field and the Tecoalli field. Area 1 is estimated to hold 2.1 Billion barrels of oil equivalent, 90% of which is oil. This is the second presence for Qatar Petroleum in Mexico. At the end of January 2018, Qatar Petroleum won exploration rights in 5 offshore blocks in the Perdido and Campeche basins as part of a consortium comprising Shell and Eni respectively. In line with its growth plans, this opportunity represents another step in implementing Qatar Petroleum’s strategy to expand its international footprint, and to pursue Latin America as an important core area for its upstream activities. Qatar Petroleum’s international upstream footprint has been expanding recently in Brazil, Mexico, Argentina, Cyprus, Congo, South Africa, Mozambique and the Sultanate of Oman.